I often choose my accommodation during my travels based on where the good coffee is. However, in the case of February’s visit to Flagstaff, I wasn’t necessarily expecting to find anything, so the fact that I woke up on my first morning, drew back the curtains in my motel room and found Matador Coffee Roasting Co. literally across the road, was entirely down to good fortune. Matador is a roaster, coffee shop and drive through, with a second, larger branch (without the roastery) on Highway 89, on the other side of Flagstaff. Occupying an old garage, it’s a handy spot to pick up coffee if you’re driving through, while if you have time to stop, there’s limited seating inside (where, if you’re lucky, you can watch the roaster in operation), or you can sit outside at one of the picnic tables set well back from the road. 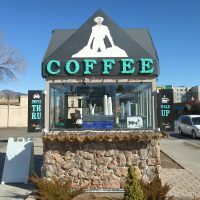 Be aware that this is more of a traditional American coffee shop, with a darker roast espresso blend and large drink sizes (12oz to 20oz), plus the ubiquitous bulk-brew options. However, there are also several lighter roasts available as pour-over, while if you’re hungry there’s a small range of breakfast bagels and cakes. Matador Coffee Roasting Co. is just south of the centre of Flagstaff, on South Milton Road. This is the old Route 66 and the natural extension of I-17, so if you’re not skipping Flagstaff entirely by heading east along I-40, it’s hard not to drive past it. Occupying an old garage, the drive-through element is in a neat, square hut on the forecourt, with a walk-up window by the pavement, and a drive-through window on the opposite side where there’s plenty of space to pull up on the broad concourse. Serving until 10:30 in the morning and noon on Friday/weekends, you’re limited to espresso-based drinks, pulled on a lever espresso machine. If you want anything else, you’ll need to head inside. The main body of Matador is split into three. There’s the outdoor seating area to the left of the building, then the building itself. On the left, the old repair workshop houses the roastery, while on the right, a smaller, glass-sided space, once the cashier’s office, holds the counter, where you need to order, although if the roll-up doors to the roastery are open, you can enter that way, making your way through to the counter. Assuming that you come in through the front door, the counter’s at the back of a long thin space that stretches off to the right. The till is dead ahead, with the espresso machine to the right. There’s a couple of stools at a window bar opposite the counter, and a set of retail shelves at the far end, where you’ll also find, tucked down past the counter’s right-hand end, a small air-roaster, used for some of Matador’s lighter roasts. If you want more seating, head to the left where you’ll find a large, six-seater communal table in the corner at the back of the main roastery, ideal for watching the roaster (a Primo PRI-50, I believe) when it’s at work. Typically, Matador roasts once a week, although there are plans to move the roastery out to an industrial unit and to use the space for more seating, so make the most of it while you can! I started several of my days in Flagstaff with breakfast at Matador, since my hotel stopped serving breakfast at nine o’clock and I invariably got up after that! While the smallest drink size is a 12oz cappuccino, on my first morning I sweet-talked my barista into making an 8oz one. This uses the Grand Canyon Blend (Matador roasts numerous blends) which went well with milk, making for a surprisingly smooth drink. I tried it as an espresso on my final visit, where I found it a bit too dark and bitter, the sort of thing that I’d have loved five years ago. It was perfectly drinkable, but I much preferred it in milk. On my second day, I spotted a pour-over bar at the back of the counter. Matador offers multiple options (usually around eight) served as a single 20oz pour-over, using a V-shaped cone (think Kalita/Melitta, but with a single hole). Many of these are dark roasts, so I selected the Guatemalan, which was the lightest roast on offer. I was rewarded with a very pleasant coffee which held its own as it cooled and was even better cold, which is just as well given how much of it there was! This entry was posted in Breakfast, Cafe/Roaster, Cafes, Cake, Coffee Terraces, Flagstaff, Lunch, Retailers, Roastery and tagged include, Matador, USA2018-01 by Brian Williams. Bookmark the permalink.